Art Blooms Week concludes tomorrow evening with a special coffee house event, from 7 to 9 p.m. at the Croft Farm Arts Center. Come out and enjoy gourmet coffee, teas and specialty desserts while you listen to poetry readings and live music! Admission is $5 per person. Croft Farm is located at 100 Borton's Mill Road. For more information, or information on any of our upcoming events, visit the Cherry Hill Arts Board online at http://cherryhillarts.blogspot.com. Beginning with the April 27 Earth Festival, thousands of residents visited Croft Farm over two weeks to learn about sustainability and enjoy local culture, entertainment, and artistry in a relaxed and affordable setting. Thank you to the various sponsors, staff and volunteers who made all our events possible. I'm already looking forward to 2014! The Township Engineering Department will continue paving and concrete repairs on Westover Drive between Pelham and Wayland roads next week, weather-permitting. These important infrastructure upgrades are part of the Township's 2012 Road Maintenance Program. For more information, please contact the Engineering Department at (856) 424-3203. Join me and hundreds of men, women and children at Challenge Grove Park tomorrow morning as we kick off the Promise Walk for Preeclampsia, a three-mile walk to raise awareness of the signs and symptoms of preeclampsia, a common and extremely serious complication of pregnancy. According to the Preeclampsia Foundation, which has sponsored the walk nationwide for the last eight years, as many as 320,000 cases of preeclampsia are diagnosed in America every year - and thousands of those cases carry severe and even life-threatening consequences for both the woman and her baby. Prenatal education and increased awareness of the symptoms of preeclampsia (which include high blood pressure, sudden swelling of face and hands, abdominal pain, blurred vision, headaches and labored breathing) and HELLP syndrom are needed to help reduce maternal and infant illness and even death. Registration begins at 8:30 a.m.; opening ceremonies start at 9:45. For more information, click here. The 2013 Summer Community Magazine has begun arriving in homes, and registration is now open for all summer programs, including our popular Morning Fun Summer Camp. If you have not yet received a copy of the magazine, view a PDF version or register online by clicking here. For more information, please call (856) 488-7868 or email Recreation@CHTownship.com. On Wednesday afternoon, Councilwomen Susan Shin-Angulo and Melinda Kane visited Melitta Coffee's Berlin Road roasting plant to celebrate the launch of the brand's new single-serve coffee line. Using customized UpShot™ Solution equipment, Melitta USA is now equipped to produce its own single-cup coffee pods, as well as provide manufacturing options to third party brands looking to enter the single-serve market. This was a tremendous step forward in Melitta's evolution as a premier coffee manufacturer worldwide, and we were proud to help celebrate. The announcement comes on the heels of a $10 million upgrade to the Berlin Road facility -- which houses all of the company's North American roasting operations -- in 2011. 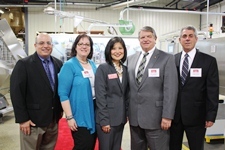 Melitta will celebrate its 50th year in Cherry Hill next month. Next week, Cherry Hill will welcome the Archaeological Society of New Jersey to town with two special events that are free and open to the public. At 7 p.m. May 14, Dr. Ilene Grossman-Bailey, a Cherry Hill native and president of the Archaeological Society, will take visitors to the Cherry Hill Library on a trip back into the past from an archaeological perspective. What lies beneath can give us a greater understanding of our heritage - from the Native Americans who inhabited this area for thousands of years, to the farmers and others who lived here before our suburban development. Then, at 11 a.m. on Saturday, May 18, the Archaeological Society will host its May meeting inside the Kay Evans Farmhouse at historic Croft Farm. The day will feature several sessions, including a prehistoric look at early Camden County, and a special presentation on the archaeology of Croft. History buffs and novices alike are certain to find this special event fascinating, and we're grateful to the Archaeological Society for choosing Cherry Hill for its May meeting. For more information on either event, click here, or contact the Cherry Hill Historical Commission at (856) 488-7886, or e-mail CHHC@chtownship.com. Registration is now open for the fourth annual Jeremy Kane Benefit Run, sponsored by Rutgers-Camden, in cooperation with Cherry Hill Township. This year's run is set to begin at 8:30 a.m. Sunday, June 9, at Cherry Hill High School East, 1750 Kresson Road. Registration begins at 7 a.m.; a brief ceremony will take place immediately before the run. This year's event includes a 5K run, as well as a 1-mile walk. The annual event funds a scholarship at Rutgers-Camden in honor of Marine Lance Cpl. Jeremy Kane, a Cherry Hill native who was killed in combat in Afghanistan in January 2010. To date, the race has raised nearly $60,000 for the scholarship. For more information or to register, click here. 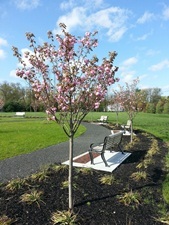 When the Cherry Hill Library dedicated its Friendship Grove on a brisk day back in December, Library staff and visitors could only dream of spring! But now that spring has finally arrived, the cherry trees are in bloom and the warm weather invites people to walk the Grove’s path, or sit on a bench to read or relax. Art Blooms Week concludes tomorrow evening with a special coffee house event, from 7 to 9 p.m. at the Croft Farm Arts Center. Come out and enjoy gourmet coffee, teas and specialty desserts while you listen to poetry readings and live music! Admission is $5 per person. Croft Farm is located at 100 Borton's Mill Road. For more information, or information on any of our upcoming events, visit the Cherry Hill Arts Board online at http://cherryhillarts.blogspot.com [http://cherryhillarts.blogspot.com/] . Beginning with the April 27 Earth Festival, thousands of residents visited Croft Farm over two weeks to learn about sustainability and enjoy local culture, entertainment, and artistry in a relaxed and affordable setting. Thank you to the various sponsors, staff and volunteers who made all our events possible. I'm already looking forward to 2014! 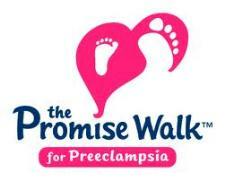 Join me and hundreds of men, women and children at Challenge Grove Park tomorrow morning as we kick off the Promise Walk for Preeclampsia, a three-mile walk to raise awareness of the signs and symptoms of preeclampsia, a common and extremely serious complication of pregnancy. According to the Preeclampsia Foundation, which has sponsored the walk nationwide for the last eight years, as many as 320,000 cases of preeclampsia are diagnosed in America every year - and thousands of those cases carry severe and even life-threatening consequences for both the woman and her baby. Prenatal education and increased awareness of the symptoms of preeclampsia (which include high blood pressure, sudden swelling of face and hands, abdominal pain, blurred vision, headaches and labored breathing) and HELLP syndrom are needed to help reduce maternal and infant illness and even death. Registration begins at 8:30 a.m.; opening ceremonies start at 9:45. For more information, click here [http://www.promisewalk.org/pfpw/fundevent.asp?vname=philadelphia] . The 2013 Summer Community Magazine has begun arriving in homes, and registration is now open for all summer programs, including our popular Morning Fun Summer Camp. If you have not yet received a copy of the magazine, view a PDF version or register online by clicking here [http://www.cherryhill-nj.com/index.aspx?nid=127] . For more information, please call (856) 488-7868 or email Recreation@CHTownship.com [mailto:Recreation@CHTownship.com] . This year's event includes a 5K run, as well as a 1-mile walk. The annual event funds a scholarship at Rutgers-Camden in honor of Marine Lance Cpl. Jeremy Kane, a Cherry Hill native who was killed in combat in Afghanistan in January 2010. To date, the race has raised nearly $60,000 for the scholarship. For more information or to register, click here [http://www.jeremykanebenefitrun.webs.com/] .